Growing up, one of my favorite children’s books was Rumpelstiltskin. 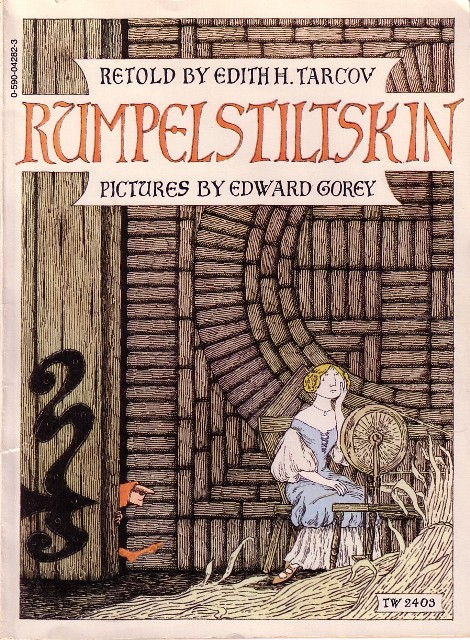 Specifically, it was the version of Rumpelstiltskin by Edith Tarcov and illustrated by Edward Gorey. The reason it was among my favorites was because it came with a cassette tape audio version of the book. I wore that cassette out. I can still pull bits and pieces from the story out and recite them with the same inflections as were on the tape. 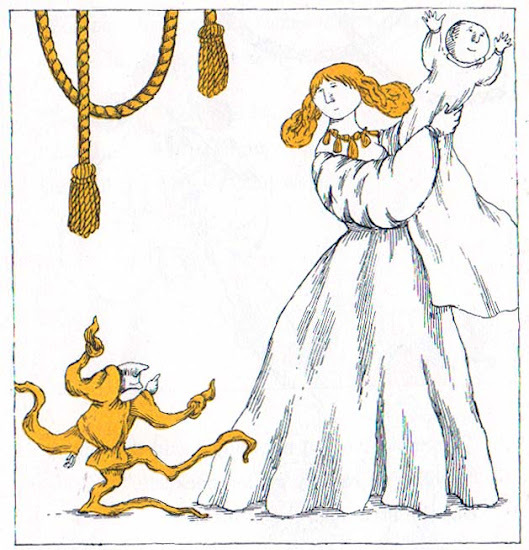 And I loved the simple illustrations long before I discovered my love for all things Edward Gorey. Edith Tarcov’s version was good for many reasons, but one that I especially appreciate is the fact that she stayed true to the original story. A poor miller with a beautiful daughter wants to impress the king who stops by so he tells the king that his daughter can spin straw into gold. 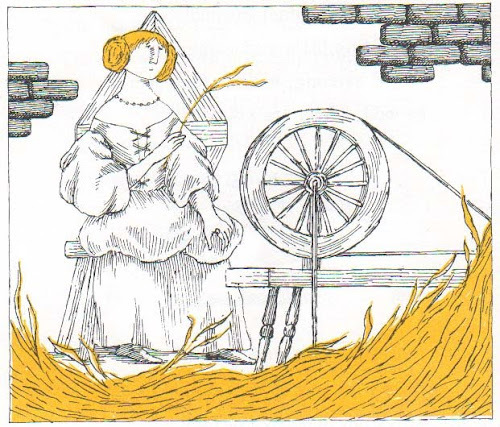 So the king takes the miller’s daughter to the castle and locks her in a room with a pile of straw and a spinning wheel and tells her that if she spins the straw into gold by morning, she can live. Now, she doesn’t really know how to spin straw into gold, so she starts crying. Just then a funny little man walks in and offers to spin the straw into gold for her in exchange for her ring. Spin, spin, spin, the job is done. The king is pleased, but greedy, so he takes her to a larger room with more straw and the process repeats, this time the funny little man accepts a necklace for payment. 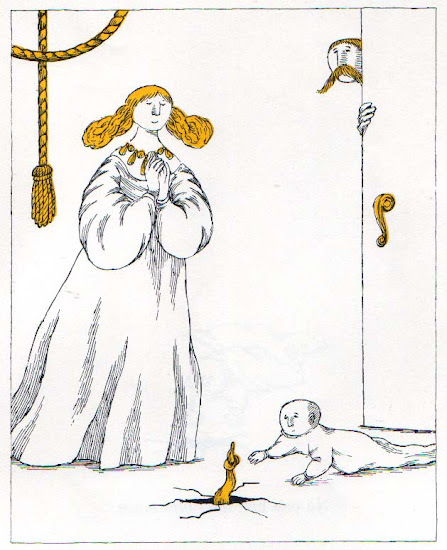 The third day, the miller’s daughter is sitting in a large room with lots of straw and still no skill for spinning, but she has nothing of value to exchange for the funny little man to do the deed for her, so she agrees to give him her first baby when she is made queen. Spin, spin, spin, the king is pleased and marries the miller’s daughter. A year goes by. The new queen has a baby but forgets the little man and her promise until the funny little man shows up to claim his wages. The queen begs and pleads for a way out of their arrangement, and the little man relents. “If you can guess my name in three days,” he says, “you may keep your baby.” So the queen sends out the messenger to collect all the names of the kingdom. First night, no luck. The messenger goes back out for all the strange names. Again, no luck. The third night, he doesn’t get any new names, but he does overhear the little man singing in the forest, and the little man’s song tells his name. The queen uses the name to get out of the baby deal, the little man stomps himself into the ground and no one has seen him since. Forgive me for telling the whole thing, but I wanted you to see the Rule of Three in action. It occurs all throughout the story. First, the miller’s daughter is subjected to three rooms of straw, over three nights, during which she gives three gifts to the funny little man. Then, when she is queen, she has three nights to come up with the little man’s name. Three is a number with a lot of baggage. We experience life in three dimensions. In mathematics, it is the first unique prime number, triangles have three sides and three points, and pi starts with it. Earth is the third planet from the sun. Three is quite popular in religious circles. But in writing and storytelling, three has other special properties. Three is the smallest number needed to see a pattern in action. Something happens once, it has no significance. Twice, it’s a fluke. Three times, that’s a pattern. And humans are trained to look for patterns. We love them! So when a story makes use of the natural inclination to seek out a pattern, it makes the story better and more memorable. In serious stories, the Rule of Three can create suspense. We always feel like we are waiting for the other shoe to drop. In humor stories, we are surprised when the third part is incongruous with the first two. As I dig into the Rule of Three, I wonder if I have used it in my writing. I wonder if I haven’t and I need to. I wonder if saying “I wonder” three sentences in a row is too much or just right. It feels right to me. Anyway, now that you know about the Rule of Three, I’d love to hear how either consciously or subconsciously you have seen it in action. Leave me a comment… or three. Comment One: Papa Bear and the pig with the straw. Comment Two: Mama Bear and the pig with the sticks. Comment Three: Baby Bear and the pig with the bricks. Lol! Good morning, Josh! Have a great day! We just finished Wizard of Oz at our house, which involved 3 companions for Dorothy and visiting 3 points of the compass inside the land of Oz. I couldn’t tell you why, though!